I got a call today from a pastor who has planted a new church and is going through the process of becoming a 501c3 non-profit and just so happened upon my blog post – Creating a Startup Budget for a New Church Plant. He was looking for some help in creating a set of financial projections as part of the process of completing IRS Form 1023 – which is required in the application process to become a non profit. 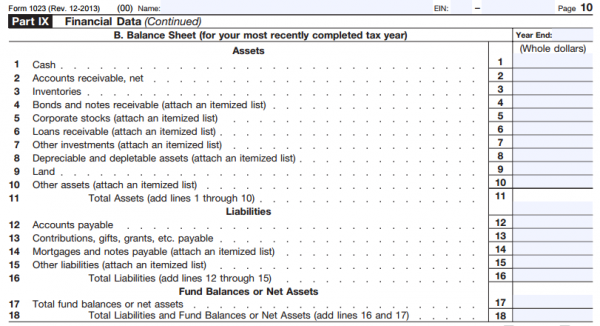 As I was looking at the Form 1023 I realized it was fairly confusing for the “non-accountant” so I wanted to write this blog post to help other non-profits complete the financial data section of the 1023. This blog post is going to focus on organizations in existence for less than 5 years. If you have been operating 5 years or more, the requirements are slightly different in terms of the financial data section. According to the IRS, you need 3 years of projections if you have not filed a tax return in the past, and you need 4 years of projections if you have completed at least on tax year. If you have been operating for 4 years or more, then you don’t need projections, you just need to show your last 4 years of financial records. To create your financial projections in the first place I would love for you to try our tool – ProjectionHub. I created a specific “Non Profit” business model template that you can use here. Gifts, grants, and contributions received – This would also include donations. Membership fees received – Non profit associations or other groups will probably receive membership fees. Gross investment income – For large endowments or foundations they will probably generate significant gross investment income. Net unrelated business income – This is income that you generate that is not directly tied to your mission. Taxes levied for your benefit – This would be if taxes are levied by the IRS and then given to you. Value of services or facilities furnished by a governmental unit without charge – This is essentially in kind services that you receive and count as revenue, but will not actually receive cash for. Any revenue not otherwise listed – This can be a catch all other revenue section. Net gain or loss on sale of capital assets – For example if you bought a building and sold it at a profit, you would record that gain on the sale as revenue. Unusual grants – This is pretty straightforward, just grants that our out of the norm for the organization. Contributions, gifts, grants, and similar amounts paid out – If your organization provides gifts or grants to others, those expenses would be included here. For example, a Church might provide gifts to members who need financial support, or a foundation might give grants to other non profits. Disbursements to or for the benefit of members – This could be a disbursement to a church member for financial assistance. Compensation of officers, directors, and trustees – Salaries and wages. Other salaries and wages – All other salaries and wages for those other than fundraising salaries and salaries of officers, directors, and trustees. Interest expense – Interest on any loans. Occupancy – These are expenses like rent, utilities, etc. Depreciation and depletion – Depreciation on buildings, vehicles or other assets. Professional fees – Attorney or accountant fees. Any expense not otherwise classified, such as program services – All other expenses. Next you will be able to download your projections from the ProjectionHub Dashboard and then enter those numbers into the form 1023.